Everybody is talking in these days in France about the possibility of either Ms Le Pen or Mr Melenchon winning the presidential election and engineering a France-exit from the Eurozone. Perhaps less noticeable but possibly even more eventful are in our view the developments that are taking place in the Italian political landscape. With the national institute of statistics (ISTAT) certifying 4.5 million Italians living in absolute poverty (three times the 2007 level, and not declining) the debate is intensifying on whether the country should still struggle to remain within the Eurozone. At least four main political parties are seriously considering the introduction of some form of parallel currency as a way to overcome the Eurosystem’s dis-functionalities. The Fiscal Money project was recently introduced in Beppe Grillo's M5S electoral program (M5S being credited with a 30% support, according to recent polls), while Mr Berlusconi, who still leads Forza Italia (13%), talks about a national parallel currency and the right wing coalition of Mr Salvini's Lega Nord and Ms Meloni's Fratelli d'Italia (17%) plans to distribute tax-backed small-denomination government bonds, albeit as an intermediate step eventually leading to ExItaly. The time is ripe for having a national debate on ‘Fiscal Money’ as an instrument to avert Italy taking the complex step of leaving the euro, while giving it a strong chance to recover from perennial stagnation. It is a tax-credit security, issued by the Government, which entitles its holders to reduce future tax payments, say, two years from its issuance. It is assigned, free of charge, to households (thus supplementing their income) and to enterprises (thus cutting their labour costs), and a portion of it can also be used to fund social programs and public investment. It is not legal tender, but it can be voluntarily used and accepted as a means of payment in exchange for goods, services and assets of all types. As to its value vis-à-vis the euro, it should trade at a discount similar to a 2-year zero-coupon bond, but if uncertainty were to widen its discount or make it too erratic, an interest rate could be paid on its holdings to stabilize its value. As the Eurostat rules stipulate, fiscal money would not add to the current budget deficit and public debt, and would be recorded in the budget only when used for tax rebates. Once assigned, fiscal money would provide additional purchasing power. In a stagnant economy with largely underused resources, a multi-year sustained program of fiscal money issuances would increase spending, raise output and employment, and generate during the 2-year deferral the additional revenues needed to finance the tax rebates, until full-employment were achieved. In the (unlikely) event of raising inadequate revenues, pre-committed safeguard measures would kick in automatically, thus offsetting any deficit. These safeguards would therefore assuage market uncertainties as to potentially negative budgetary implications. The reduction of enterprise labour cost, on the other hand, would improve Italy’s external competitiveness and prevent trade balances from worsening under increasing demand and support the output multiplier effect. In conclusion, whereas there would be no downside risks even in the event of the program fiscally underperforming, in all other cases the economy would recover as expectations steadily improve, confidence is restored and enterprises start new investments. How does fiscal money work? Fiscal money would be exchanged across a nationwide electronic platform where all resident agents hold accounts that can be accessed through cards, mobile phones or the Internet. Government would allocate new fiscal money issuances by directly crediting the accounts of select agent categories. Payments and value transfers would take place via the simultaneous debiting and crediting of the accounts of payers and payees, respectively, and fiscal money would become the settlement instrument for all transactions executed in the platform. Fiscal money could also be exchanged as an asset, being demanded from those who may want to use it for future tax rebates or to make profit out of asset price arbitrage. Participation in the platform would be governed by a voluntary arrangement whereby the state and individual agents (enterprises, workers, pensioners, merchants and utilities, as well as banks and other financial institutions) accept to use and receive fiscal money for transaction purposes. While not compulsory, acceptance would be actively promoted and supported by Government, with a view to maximizing efficient and effective circulation of the new monetary instrument. 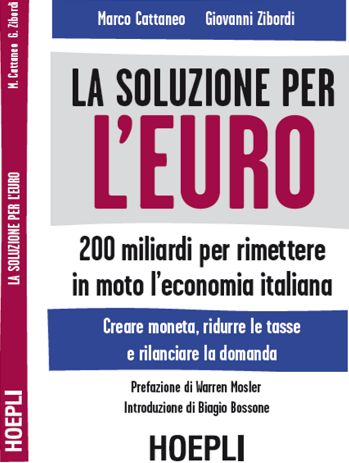 In practice, fiscal money is the only option available to reflate the economy of a country, such as Italy, with no fiscal space left, no monetary sovereignty, and thus no control over exchange rate policy. We believe it is the only ‘third way’ possible between austerity and Euroexit, capable to help the country survive the shortcomings of the deeply flawed euro architecture.